A diary is where you keep personal musings about your life, the people in it and the things you care about. Your diary is a safe place where you can be honest and candid about your thoughts, feelings and opinions. Diaries are for the eyes of their owners and no one else. Your diary is for you and by you. Reflect, create, dream. Do whatever you want with your words. What is a dairy entry? A diary entry is a section of writing that has been organized by date. The entries within your diary are how you organize the thoughts, feelings and opinions you are pouring into it. They break up your diary into smaller pieces. Think of them like chapters of a book. They can be as short or as long as you want. Since diary entries are like chapters in a book, you first have to decide what your book is going to be about. Brainstorm ideas for your diary, like whether you want it to be just about you or about a specific topic. Once you have a theme, then you can begin! Since your diary will be kept over a long period of time, each of your entries should be dated based on when you write them. Penzu’s free diary software does this for you. Like chapters in a book, you want your diary entry to have some sort of theme or direction. Is it about what you did today? Is it about an upcoming event? An event that already happened? Try and stay focused when writing. Don’t feel like your entries need to impress anywhere. They are just for you, so relax and go for it. The worst person to lie to is yourself, so when writing your entry try and be as honest as you can. When you’re writing, try and write as if you’re writing to a friend. How would you tell a story to your best friend? That is how you should be writing about it in your digital diary. If you feel like you’re at a loss for words, just keep writing through it. Feel free to record your train of thought. Think about why you have hit a wall. What is getting in the way? Think about what you’re writing about and how that could be effecting your entry – and write about that thought process! Once you have finished your entry, re-read your entry and maybe list some things you hope to focus on in your next entry. Reflect on what you have just wrote. Maybe some new things will come to mind that you can jot down before you put your diary down. The more frequently you write entries in your diary, the more you will enjoy doing it and the more you will learn from them. Set a certain time during the day that you want to write in your diary and try to keep to that schedule. The more you practice writing diary entries, the better you will become at it. Now that you have read these tips, create your online diary with Penzu and start adding entries! Practice makes perfect, so start practicing your writing today! There's no time like the present - start your free online journal today! 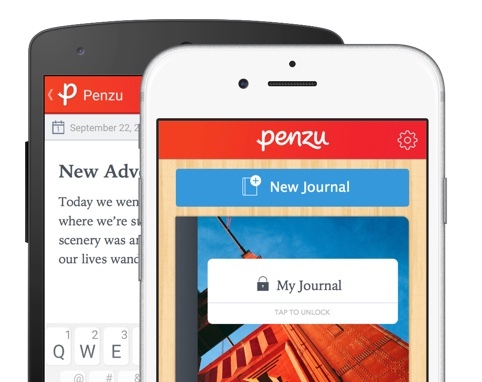 Get access to your diary wherever you are – download the free Penzu app for your all of your iOS and Android devices today! Write about your work experiences to reflect on your professional life to track your day-to-day work, consider career opportunities, set milestones, and achieve your goals. Whatever your reasons for keeping a diary, you will surely appreciate the ease and convenience of an electronic diary. Unlike printed diaries, which we agree are pretty “bleh”, electronic school diaries are much more customizable and some have multiple categories pre-set for you. An academic diary can take some the stress and hassle out of your life by making sure you manage your responsibilities for school better. Food diaries are an excellent way to track what you're eating.